Starting on Oct. 1, Americans can purchase individual health insurance in what is known as the nongroup market on the newly established electronic health-insurance exchanges that were called for in the Affordable Care Act of 2010. That coverage will take effect on Jan. 1. In the meantime, Americans will be bombarded with information on the premiums they will pay for coverage on the exchanges. Much of that information will be pure speculation, and a good part of it will be strategic misinformation (a topic that I will explore more fully in a future post). So let’s review what the new arrangement seeks to accomplish. Pi denotes the premium quoted to the individual applicant “i.” Xi is an actuarial estimate of the insurer’s expected outlay for covered health benefits used by that individual “i” in the coming year. L is a “loading factor” added to cover the additional cost of marketing and administration, as well as a target profit margin. Basing the premium on an individual’s health status is known as “medical underwriting.” The insurer includes in the application form a lengthy questionnaire on the applicant’s current and previous medical conditions and use of health care. Jonathan Cohn has described this process well in The New Republic, drawing particular attention to the long list of medical conditions for which the insurers will reject an applicant. The number of applicants refused coverage in the nongroup market can be high. In a recent paper by the actuarial benefit consulting firm Milliman, prepared for the Indiana Health Care Exchange Policy Committee, an average of 13 percent of applicants age 35 to 39 and 24 percent of applicants age 55 to 59 were found to have been denied insurance coverage in Indiana’s nongroup health insurance market (see Figure 3). Although the rejected individuals might find coverage in a state-run high-risk pool, premiums for that coverage and out-of-pocket expenses tend to be very high. Until 2012, each insurer was free to set its own load factor L (as in the equation above), constrained only by the market. In the large-group market serving employers with many employees, the load factor tended to range from 15 to 30 percent, corresponding to a ratio of health benefits paid for apremium collected (known as the medical loss ratio) of 75 to 85 percent. In the markets for small groups and individuals, however, the load factor could exceed 80 percent (with a medical loss ratio of 45 percent) This made the premium charged the insured almost double what the insurer paid for health benefits. Under the Affordable Care Act, effective January 2012, the load factor must be at or below 17.65 percent in the large-group market (a medical loss ratio of not less than 85 percent), and at or below 25 percent in the small group and individual market (a medical loss ratio of not less than 80 percent). By itself, this provision should lower the premiums charged to the insured in the nongroup market. Under the law, an individual health plan selling policies in the small-group and nongroup market — whether it sells policies through the state’s exchange or not — will be free to set its own premium for a given policy. But within a given age group, it must apply the same premium to all comers, regardless of their health and their gender. Furthermore, the health plan cannot reject any applicant willing to pay that premium, a provision called “guaranteed issue,” or cancel existing policies. In other words, the Xi based on the individual’s health status in the equation above will be replaced by the average expected health spending per insured, with the average calculated over the insurer’s entire anticipated risk pool of insured members of a given age. To calculate the average, the insurer must consider as one single risk pool all enrollees in all health plans offered by the insurer, whether or not they are offered on the exchange. This form of premium setting is known as “community rating.” Because it forces healthier individuals to subsidize sicker individuals through the community-rated premiums, it has been much debated. Community rating invites “cherry-picking” by insurers — i.e., attempts to attract mainly low-risk applicants. To limit the profit potential from cherry-picking, there will be post-enrollment risk adjustments through which funds are transferred from insurers ending up with relatively healthier risk pools to those ending up with relatively higher risk pools. The community rating under the law is not the pure version found in thesocial insurance systems of Europe (e.g., Switzerland, the Netherlands and Germany) or Asia, where even age is not considered in setting premiums. Rather, the American version is called adjusted community rating, because it does allow insurers to adjust the community-rated premium for the age of the applicant. Age-adjusting is done by multiplying the community-rated premium for the youngest members in the expected risk pool by a standard, multiplicative age ratio to be used by all insurers. Thus the quoted premium can increase step by step with age, but only up to a multiplicative factor of 3. At a given age, smokers can be charged up to 1.5 times the regular premium. The change from what was in place before the Affordable Care Act to post-law arrangements in the nongroup market can be illustrated graphically. In the chart below, we assume initially that all members of a given population are covered by either medically underwritten or community-rated health insurance, with a given package of covered health benefits. The white line represents the premium individuals would have to pay under medical underwriting. The dashed segment of that line is meant to show the actuarial cost and the premium range in which insurers in the real world would reject applicants outright. The green line shows the community-rated premium for this same population. We assume here that age is either not factored into the premium or the population in question is all of the same age, which is why the green line is horizontal. 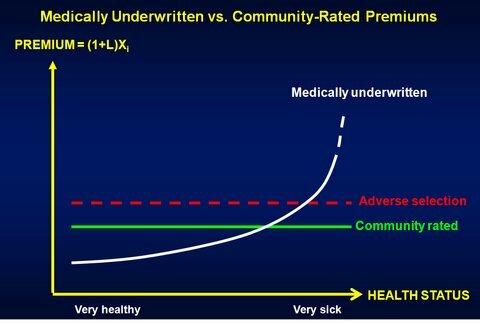 As the chart illustrates, a switch from medically underwritten premiums to community-rated ones raises the premiums for the relatively healthier members of the insurer’s risk pool. Many of them will suffer what has come to be called premium shock. Younger and healthier members of the pool should realize that, in effect, they are buying a call option that allows them to buy coverage at a premium far below the high actuarial cost of covering them when they are sicker. The price charged the healthy for this call option is the difference between the premium they must pay and the current lower actuarial cost of covering them. Furthermore, for Americans in households with incomes below 400 percent of the federal poverty line, the green and red lines exaggerate the impact of the law on their spending. These Americans will be granted often quite generous, income-dependent federal subsidies toward the premiums they face on the exchanges and their out-of-pocket costs for health care. This makes it well-nigh impossible to make general statements, based on averages, about the net after-subsidy impact of the law. where Pc now is a common, community-rated premium quoted to all applicants in a given age group, Xc is the expected per-member outlay on health care for the insured, averaged over the insurer’s entire risk pool, and TCi is the income-based federal subsidy to which individual “i” may be entitled. It is now easy to see how opponents of the health care law seeking to denounce it can engage in judicious half-truth. To that end, one compares the premium Pi currently paid by a perfectly healthy individual for a relatively skimpy insurance policy with the community-rated premium Pc, which covers a richer benefit package, and one would not, of course, mention the federal subsidies toward the quoted premium Pc and out-of-pocket costs, which can substantially reduce the overall out-of-pocket outlays for health care of lower-income individuals. That said, however, some higher-income individuals and small businesses are likely to see their premiums go up as a result of the new regime. Not everyone gains from the change. Less frequently noted in commentaries about the law — certainly among its critics — is that the law is likely to bring what I call “premium joy” to individuals and families with health problems. Many such people simply could not afford the high, medically underwritten premiums they were quoted in the traditional nongroup market. This joy will be shared by high-risk applicants who were refused coverage by the insurer, along with people now in high-risk pools. One major design flaw in the law should be noted. The law mandates all individuals to have insurance coverage for a stipulated minimum benefit package, a necessary companion of community rating. Because the penalties for disobeying that mandate are so low, many young, healthy people may prefer to pay the penalty and remain uninsured until they fall ill, when they can get community-rated coverage. That possibility — called “adverse risk selection” — could raise the entire community-rated premium curve from, say, the green curve to the red curve, adding to the premium shock of healthy people. Although the federal subsidies will mitigate this effect for many insured, better approaches areavailable to deal with this problem.